St Simon is surnamed the Canaanean or Canaanite, and the Zealot, to distinguish him from St. Peter, and from St. Simeon, the brother of St. James the Less, and his successor in the see of Jerusalem. From the first of these surnames some have thought that St. Simon was born at Cana, in Galilee: certain modern Greeks pretend that it was at his marriage that our Lord turned the water into wine. It is not to be doubted but he was a Galilean. Theodoret says, of the tribe either of Zabulon or Nepthali. 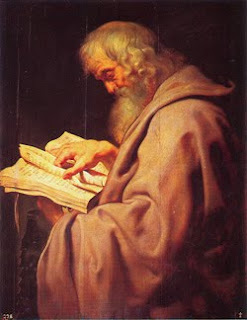 Hammond and Grotius think that St. Simon was called the Zealot, before his coming to Christ, because he was one of that particular sect or party among the Jews called Zealots, from a singular zeal they possessed for the honour of God and the purity of religion. A party called Zealots were famous in the war of the Jews against the Romans. They were main instruments in instigating the people to shake off the yoke of subjection; they assassinated many of the nobility and others in the streets, filled the temple itself with bloodshed and other horrible profanations, and were the chief cause of the ruin of their country. But no proof is offered by which it is made to appear that any such party existed in our Saviour's time, though some then maintained that it was not lawful for a Jew to pay taxes to the Romans At least if any then took the name Zealots, they certainly neither followed the impious conduct nor adopted the false and inhuman maxims of those mentioned by Josephus in his history of the Jewish war against the Romans. St. Simon, after his conversion, was zealous for the honour of his Master, and exact in all the duties of the Christian religion; and showed a pious indignation toward those who professed this holy faith with their mouths, but dishonoured it by the irregularity of their lives. No further mention appears of him in the gospels than that he was adopted by Christ into the college of the apostles. With the rest he received the miraculous gifts of the Holy Ghost, which he afterwards exercised with great zeal and fidelity. If this apostle preached in Egypt, Cyrene, and Mauritania, he returned into the East; for the Martyrologies of St. Jerome, Bede, Ado, and Usuard place his martyrdom in Persia, at a city called Suanir, possibly in the country of the Suani, a people in Colchis, or a little higher in Sarmatia, then allied with the Parthians in Persia; which may agree with a passage in the Acts of St. Andrew, that in the Cimmerian Bosphorus there was a tomb in a "rot, with an inscription importing that Simon the Zealot was interred there. His death is said in these Martyrologies to have been procured by the idolatrous priests. Those who mention the manner of his death say he was crucified. St. Peter's Church on the Vatican at Rome and the Cathedral of Toulouse are said to possess the chief portions of the relics of SS. Simon and Jude.